This gives an idea of my approach when working on an illustration. I generally block everything in light blue pencil, followed by slighty tightening things up with a regular graphite pencil. Next comes the tedious but ultimately satisfying inking process of crosshatching with rapidographs, going from the finest point size of 0.13 right up to 0.50. This is where usually the true essense of the particular subject matter comes through, almost molding everything with small repeated lines. Rapidographs are technical pens generally designed for architects and can be quite fragile; as a result I've gone though many in the process. Finally, the layering of watercolors with a bit of watered down white acrylics and white pencil for highlights results in the final piece. 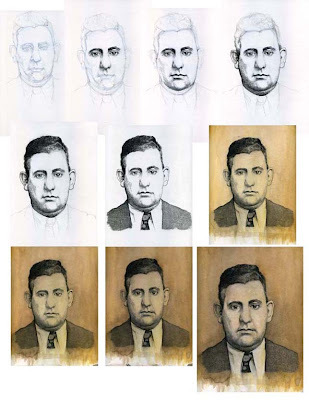 The subject of this illustration is Dutch Schultz's right hand man and muscle, Bo Weinberg. Weinberg was one of the very few Jewish mobsters who was literally fitted with a pair of cement shoes and dumped into the East River. While the borderline maniacal Bronx beer baron awaited a trial in the upstate New York town of Malone, Weinberg, sure his boss was cooked, double crossed him by joining Lucky Luciano's rival mob; handing over all of the Dutchman's illegal booze assets and Harlem numbers racket as a peace offering. The power brokers of New York's underworld, including Meyer Lansky and Bugsy Siegel, were sure Schultz was headed up the river, so no one was shocked more than Bo himself when Schultz was found not guilty by the gullible small town jury who were swooned by Arthur Flegenheimer's (his real name) big city charms. A quietly infuriated, scheming Schultz and some assertive associates gave his former bodyguard a boat ride along the East River, and who would return to the Manhattan docks one man short. Nice to see the process. Thanks for sharing.